Previous research projects: Forest ecology and conservation projects in Panama, Guatemala, Honduras, Belize, The Philippines, Puerto Rico. 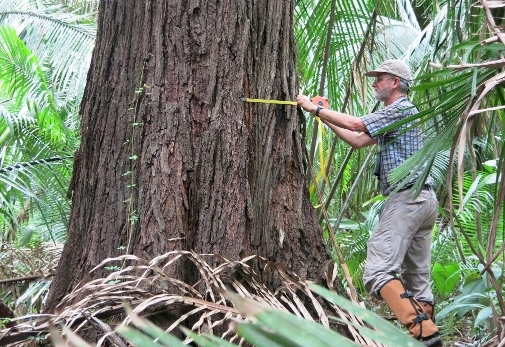 Current research: Tree dynamics and species composition in tropical forests: field work in Belize, Puerto Rico, and Panama. Service and other Projects: Personnel Committee, Department of Environmental Science, UPR-RP; workshops on tree identification in Belize; website with information to increase use of the Rio Bravo Conservation and Management Area, Belize; journal and proposal reviews. Peña-Chocarro, M., S. Knapp, N. Brokaw, N. Bonilla, A. L. de MacVen, J. J. Ortíz, E. de Pöll, J. Tun-Garrido, D. Galicia, and D. Alexander. 2011. Árboles del Mundo Maya. UVA Impresores S.A., Madrid. Zimmerman, J. K. , J. A. Hogan, A. B. Shiels , J. E. Bithorn, S. M. Matta Carmona, and N. Brokaw. 2014. Seven-year responses of trees to experimental hurricane effects in a tropical rainforest, Puerto Rico. Forest Ecology and Management 332:64-74. Brokaw, N., and S. E. Ward. 2016. Vegetation. Pages 367-371 in W. R. T. Witschey (ed.). Encyclopedia of the Ancient Maya. Rowman & Littlefield, Lanham, Maryland. Ward, S. E., and N. Brokaw (eds.). 2016. Synergies between biodiversity and timber management. Special Section, International Journal of Biodiversity Science, Ecosystem Services & Management, Special Issue, March 2016. Ward, S. E., and N. Brokaw. 2016. Editorial: Synergies between biodiversity and timber management. Special Section, International Journal of Biodiversity Science, Ecosystem Services & Management http://dx.doi.org/10.1080/21513732.2016.1169578, March 2016.